Mit der Erstausgabe dieses 3-sätzigen Konzerts für Querflöte, 2 Violinen, Viola und Basso continuo wird das einzige überlieferte Flötenkonzert Wilhelm Friedemann Bachs einer breiteren musikalischen Öffentlichkeit wieder zugänglich. 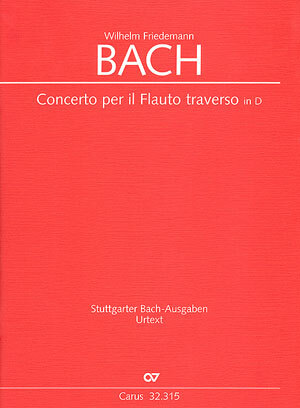 Die im Orchestersatz durchsichtig-filigrane, fast durchgehend 3-stimmige Komposition trägt unverkennbar die individuellen künstlerischen Züge des ältesten Bach-Sohnes. 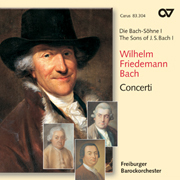 Die kritische Edition (nach der einzigen bekannten Quelle aus dem Bibliotheksbestand der Berliner Singakademie) bildet einen Vorabdruck aus Band IV/2 der Gesamtausgabe der Werke Wilhelm Friedemann Bachs. Three recordings of this concerto have reached us so far, the last (from Carus) proclaiming itself as the first (see p. 21). 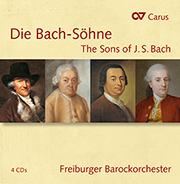 The work itself has appeared in various catalogues, but was not taken seriously since the source is anonymous, apart from a late, implausible ascription to Quantz. 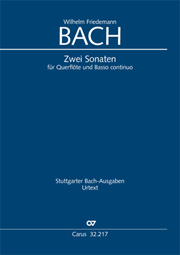 The Quantz thematic catalogue hives it off as QV 5: Anh.6; the W. F. Bach catalogue by Falck (1913) calls it spurious, a judgment with which Peter Wollny agreed in his 1993 Harvard thesis on WFB. There is some objective reason for the ascription: WFB's hand in the figuring of the continuo part was noticed two centuries ago. But study of the music (plus, a cynical observer might surmise, a desire to exploit the rediscovery of the Sing-Akademie library in Kiev) convinces Wollny, and probably the listener to any of the recordings, that the ascription is at least plausible, perhaps more. 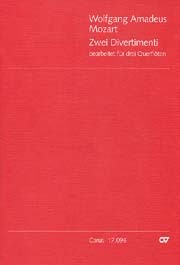 This edition is an extract from a future vol. IV / 2 of a projected complete edition of WFB, so editorial commentary is deferred to that. Assuming that parts are available, it is a valuable addition to the flautist's repertoire; the accompaniment is for strings and harpsichord.